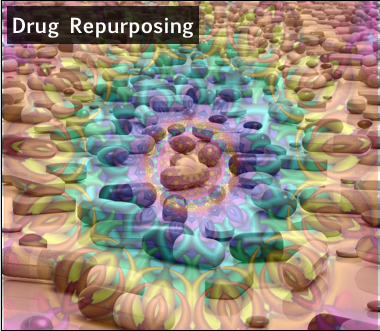 The Open Drug Discovery Teams project started out as a minimum viable product that obtained all of its data from Twitter, using a server application that periodically polls for relevant hashtags. The development version has now been extended so that topics can also be associated with RSS feeds, and each of the topics has been paired with a feed created via Google Alerts. These source documents are spliced in with the Twitter feed, e.g. the Malaria topic now contains factoids that are obtained by looking for #malaria and a timely feed of articles that Google thinks are relevant to the “Malaria” keyword. All of the crowdsourcing is still done via Twitter, regardless of where the content came from, i.e. you emit a tweet to endorse or disapprove. And using Twitter is still the appropriate way to inject content into ODDT, because you can just tweet it out and wait for it to be collected. Addition of the Google-curated content provides a nice supplement the content stream. It will be going live soon, following a bit more testing on the development server. 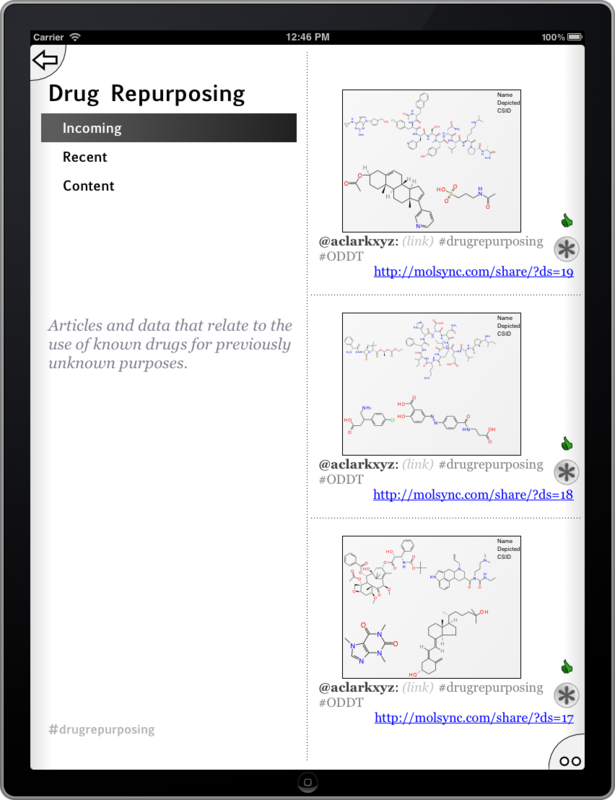 The Open Drug Discovery Teams (ODDT) app was dreamed up earlier this year by Sean Ekins, and by March 2012, it was a minimum viable product with an app on the iTunes AppStore and a server doing its thing on the cloud. The purpose of the project is to aggregate chemistry data from public sources, and put it together under a set of topics. These topics are mainly related to efforts to find cures for rare and neglected diseases, and also for industry relevant precompetitive topics like green chemistry. The ODDT project is heavily focused on open data, and is an attempt to introduce crowd curation of data to open science. 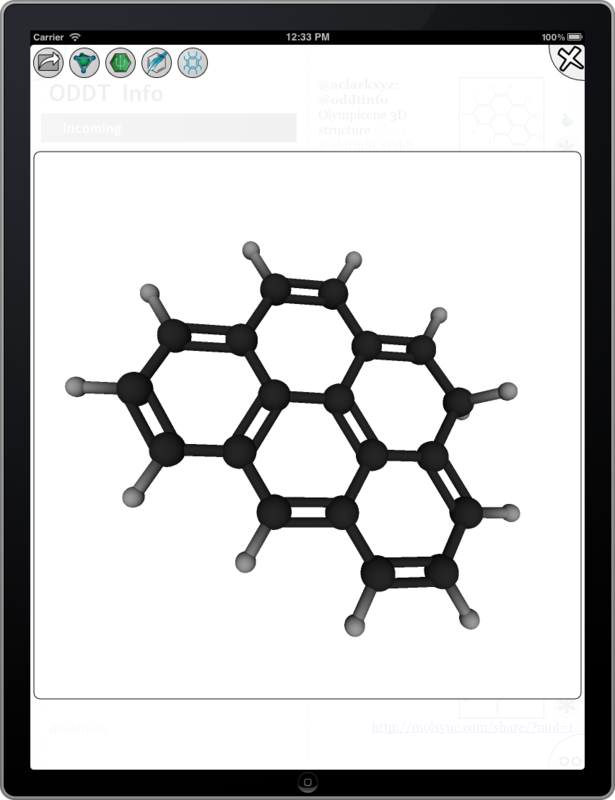 While we are retaining ownership of the tools, which are based on proprietary chemistry app libraries and back-end cheminformatics tools from Molecular Materials Informatics, the front-end app is free to install and free to use. And we would like to keep it that way. Unfortunately cloud hosted servers are not free, and so far we have been paying the hosting cost out of pocket, as well as designing and building the software in our spare time. So now its time to ask people to pitch in, via the crowd-funding project on IndieGoGo. If you think propagating open science for good causes is an idea that ought to be encouraged, and approve of broadening the communities of people who are knowledgeable and potentially able to contribute to these kinds of topics, then please get involved. If you can donate to this project, that would be great. If you can tell people about it, that would also be great. If you’ve read this blog post, then surely you can tweet a link to it, or post it on your social network of choice! We would really appreciate it. 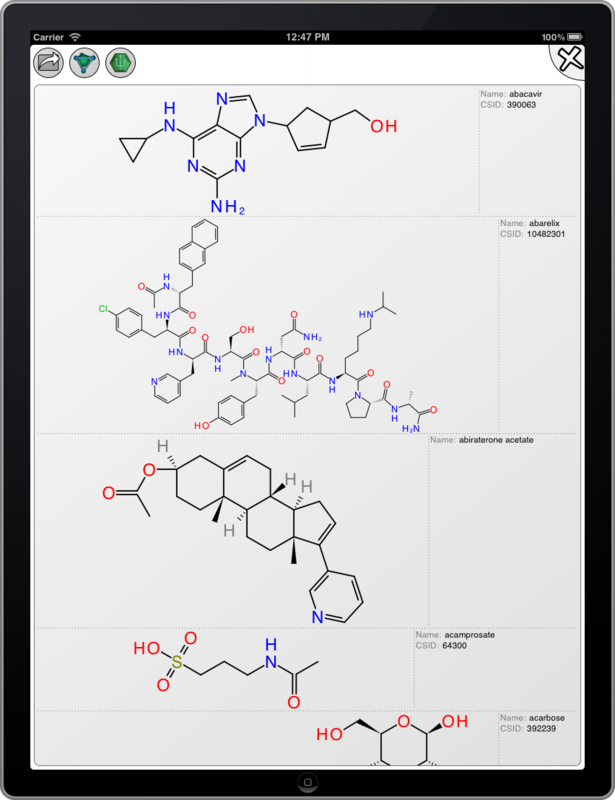 If you’ll excuse the tongue-twister in the title, the Approved Drugs app is now available on the iTunes AppStore. There is now an official documentation page for it, which covers all the functionality. With the app being live for barely 24 hours, already ideas for enhancements are starting to manifest themselves. One of them relates to a paper that appeared in Nature a few days after the app was submitted, entitled Large-scale prediction and testing of drug activity on side-effect targets. This paper describes a similarity-based approach for predicting the likely targets for a potential structure, by comparing it to known activities of existing structures vs. known targets – and hence creating a predictivity model for side effects. 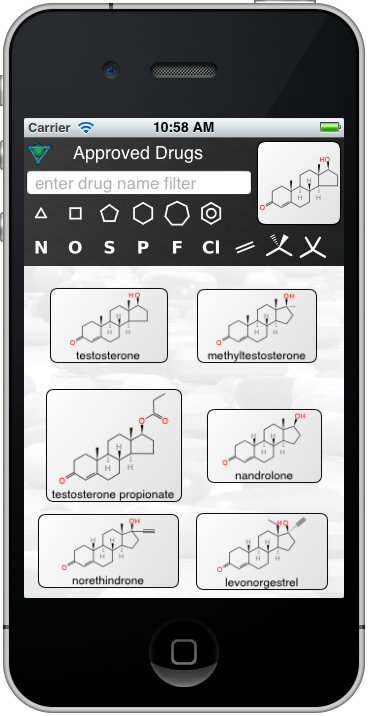 The technology used to accomplish this is quite similar to what the Approved Drugs app already has. And the paper included quite a bit of useful source material in the supplementary information. So future revisions may just pick up the pace quite a bit! 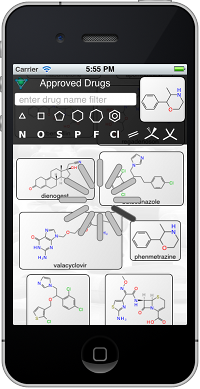 A new app from Molecular Materials Informatics is now waiting on the iTunes AppStore: the Approved Drugs app, which provides a list of drugs (structure, name) from the set of drugs that have been approved by the FDA.